Yes, I know that I really need to improve my picture-taking and take the darn picture before serving. This time I remembered as these two leftovers (from a batch of nearly 30) were on their way out the door. I used the William Sonoma apple and pumpkin molds, available here. The pumpkins were extra cute, which is why I think they went faster. To make the filling, I used a regular apple pie recipe, but cooked it until the apples had begun to soften on the stove. Divide the dough into quarters, wrap with plastic wrap and refrigerate for at least 2 hours or overnight. Peel and dice the apples into 1/2 inch cubes. Dunk them in water and lemon juice as you chop..this stem hinders oxidation which isn't important when baking a pie, but I always do this whenever I cut apples. Combine apples, sugars, salt, and cinnamon in a small sauce pan. Over medium, cook until apples begin to soften or about 10-15 minutes. Stir frequently to prevent sugar burning. I wasn't sure whether to add the flour or not (remember this was from a pie recipe with no prebaking step), so I did so after about 5-10 minutes to thicken the sauce. Adding it so late likely risks lumps, so there is probably little harm in adding it earlier. Just make to stir well to prevent sticking or burning. Chill the filling while you cut out the pie shapes. The dough should be about 1/8th to 3/8ths inch thick. The original recipe says 1/16th-1/8 inch, but since this dough shrinks when overworked (which I do), making a thicker crust help mitigate this problem. Plus, there will be some give to crimp the edges together if there's extra dough. I didn't think the end result was too thick. Place the bottom shape in the mold and add 2 T of filling. Brush the edges with water before adding the top shape. Add the top and press tightly to create a seal and create pretty edging. Remove the pie from the mold and place on a parchment-lined baking sheet. Repeat with the remaining dough and filling. 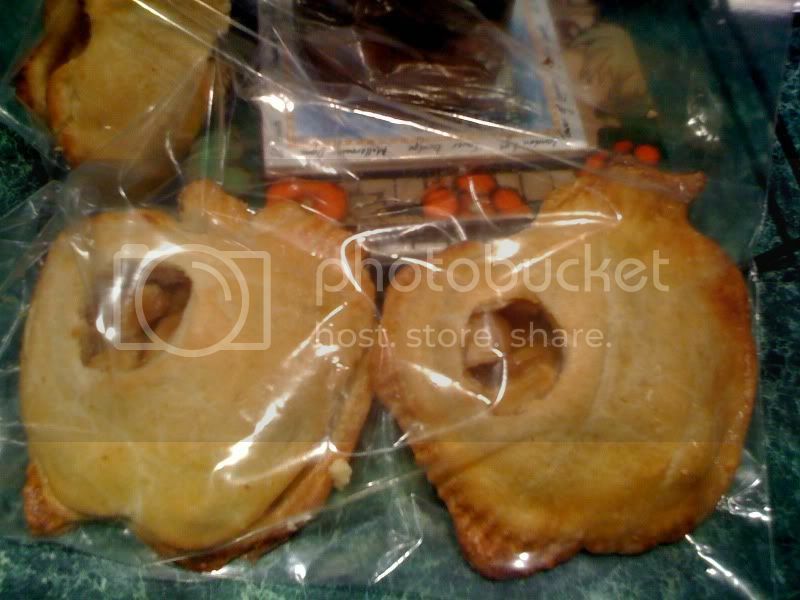 Freeze the pies for 30 minutes or refrigerate for a couple hours. Brush the top of the pies with egg wash and sprinkle with coarse sugar, if desired. Bake until the crust is golden brown and the filling is gently bubbling, about 20 minutes. Transfer the pies to a wire rack and let cool for 10 minutes.